The BCC VR Blur filter emulates the look of shooting with soft focus or with a lens diffusion filter, generating out of focus effects. This filter was designed from the ground up to operate in VR 360 with multiple edge wrap modes to process pixels that reside along the edge of the 360 seam (non-VR aware filters will generate a hard line across the seam and will not create a convincing look.) 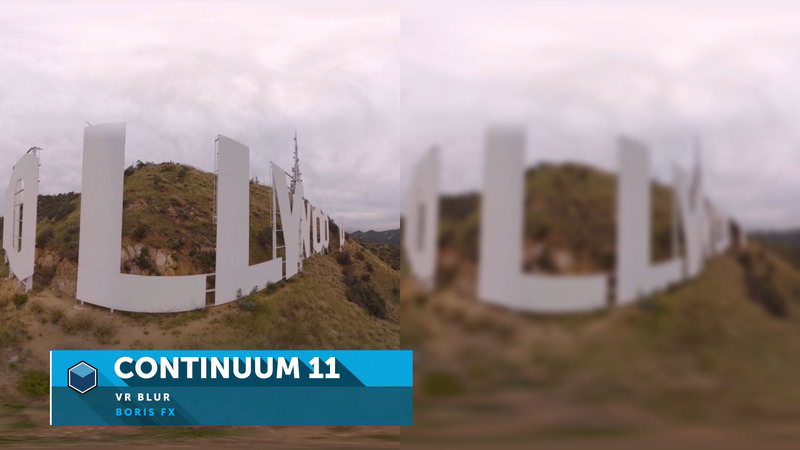 The VR Blur filter includes independent controls for the amount of blur along the horizontal and vertical axis, making it easy to emulate fast camera pans. On-screen control widgets are included in this filter, which makes it easy to set up the effect while maintaining visual focus on the image result in the viewer / comp window. Contains options for specifying the VR source and destination format. Edge Mode: Only available when the Source -> Input Horizontal FOV pop-up is set to 180, this pop-up contains options for how blurred pixels are treated along the edge of the seam.